An East Bay woman said she was denied from seeing her dying father by Washington Hospital staff in Fremont minutes before he passed away Friday morning but the hospital said it was due to a safety issue. Ian Cull reports. An East Bay woman said she was denied from seeing her dying father by Washington Hospital staff in Fremont minutes before he passed away Friday morning but the hospital said it was due to a safety issue. 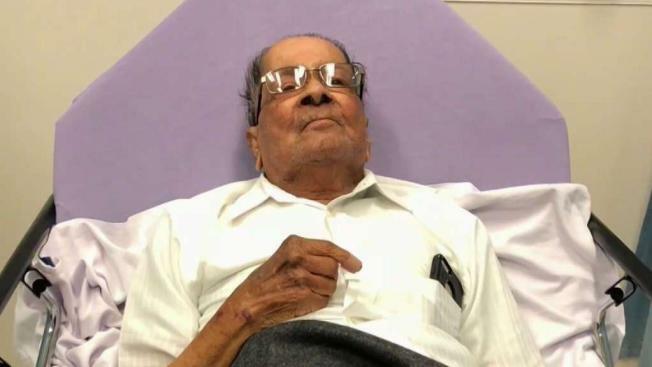 Meeta Chetal’s 83-year-old father Jai was hospitalized with fluid in his lungs two weeks ago. He was reportedly in good condition until Friday morning when they called her saying he complained about chest pain and wanted to see her. Chetal rushed to the hospital but upon arrival, she was told her name was flagged because of an incident that occurred the day before. She claims her and her uncle were asking a doctor when the next operation would take place and after a brief argument, the uncle reportedly touched the doctor to get his attention. "He goes 'I already answered this question two or three times' and then he got agitated and said 'don't touch me.' All he did was tap on his hand," Chetal said. The hospital said in a statement, "[they] behaved in an aggressive and threatening manner that included physical contact with a physician who was trying to provide appropriate care to their relative." Chetal said that during the delay of about 20 minutes, her dad went into cardiac arrest. She was sent up right away but he died soon after. "It prevented me from saying goodbye to him while he was still alive," she said. "That hurt me, maybe he wanted to say something." Chetal said she doesn’t think the hospital’s actions were ethical and she wants answers. "I don’t think anybody or any family member should have to go through something like this," she said. The hospital also said that while they provide support for family members, it cannot take priority over the safety of other patients and hospital staff. Administrators said the situation was handled properly. Washington Hospital puts patient care first at all times. While we strive to provide support for family members, providing that support cannot take priority over protecting the safety of other patients in the Hospital and the safety of our health care staff. When a family member acts in an inappropriate and threatening manner, the Hospital must take steps to protect the wellbeing of the other patients and staff. In the case of patient Jai Chetal, two family members, a daughter and a brother, behaved in an aggressive and threatening manner that included physical contact with a physician who was trying to provide appropriate care to their relative. As a consequence, they were asked to leave. Afterwards, in an attempt to reason with the family members, a Senior Administrator called each of them at home. He was able to talk to the daughter to review why their behavior was not acceptable. The daughter agreed to wait for his call the following morning before visiting the Hospital. The patient's condition deteriorated. A physician and a nurse each contacted the daughter regarding changes to the patient's condition. The daughter said she was on her way to the Hospital. When the daughter arrived, she was momentarily delayed at the front desk pending the arrival of the Senior Administrator. She was then escorted to the patient's room. While walking to her father's room, the daughter phoned her family and a Hospital representative confirmed the brother was allowed to come to the Hospital. He declined. The daughter was present when the patient passed away.